As I sit here today with a pile of “to do’s” on my never ending list of to do’s, I am feeling called to share the experiences of the past month or so. Walking the path, as this title implies, not only means walking the path a labyrinth design creates to find the inner meaning of it all but also walking the path of my truth and what it means to create something that was not there before and also how to sustain it. In simplier terms, creating garden programs is one thing, walking the path it takes to sustain them is something else entirely. I look back on this past month or so in awe. 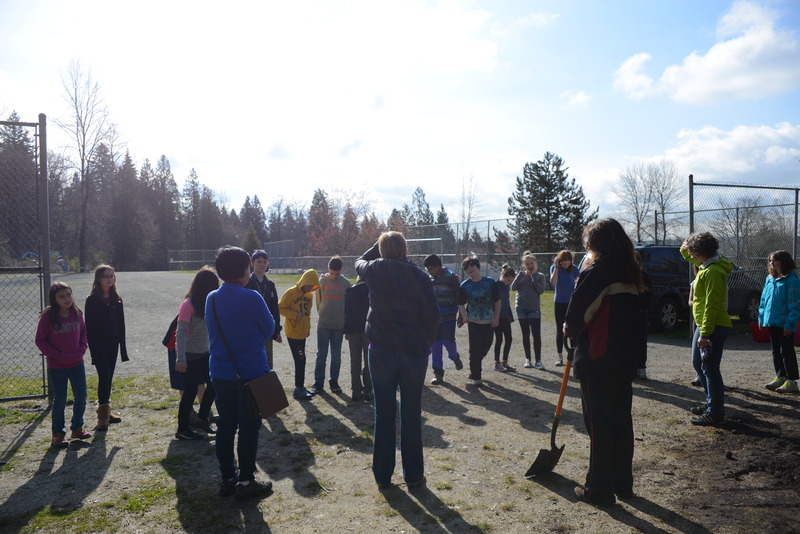 Between building and talking about the labyrinth with most of the Forest Grove Elementary school population, planting seeds in 2 school gardens with all 10 and 12 classes, teaching 4 cooking classes and recruiting volunteers, you can hopefully appreciate why it’s taken me so long to post anything in a blog. Choosing what to post is the challenge so I’m choosing to follow my heart with this one and write about the most important lessons I’ve learned through all these various experiences. Building a labyrinth with a group of 4 to 5 class groups who have never done this before can create a lot of hesitation. Staying open to how everything unfolds and to trust in the unknowing process has worked wonders. It allows for us to make mistakes and to learn from them as well as being open to our greatness too. All along the way we kept in mind we had never done this before which in my mind meant, I’m giving myself a break and not choosing perfection. That was a tough lesson for sure coming from someone who never joined the track team because I knew I’d never win a race. Working with a group of people who were looking to me for guidance, I had to stay open to the guidance and from wherever it came from. In the end though, I had to also listen to my gut and heart when it came to making a decision about anything. When things click, when you receive an instinctual knowing of what to do next, you have to trust that. Guiding the group of students through the experience of building the labyrinth, there was one basic principle I wanted to instill in everyone’s mind. This was a very important task we were all about to under take. One that would not be entered into lightly or with any sense of disrespect. As the first group of students literally were laying down the soil, the very foundation for the design, I told them they were to walk into this space with a sense of reverence for they were given the task of being the first to create a tool that would be used by many including themselves to find peace and happiness. The energy they brought into the green space was to be the energy of respect and honor. The Grade 7 class were given a math problem to create the circuits of the circular designs of the labyrinth. We knew that this was not an easy problem for the entire group after speaking with the teacher. It wasn’t expected that all would participate but I trusted that those who would know what to do would be enough and could then be teachers to others who needed help with the problem. 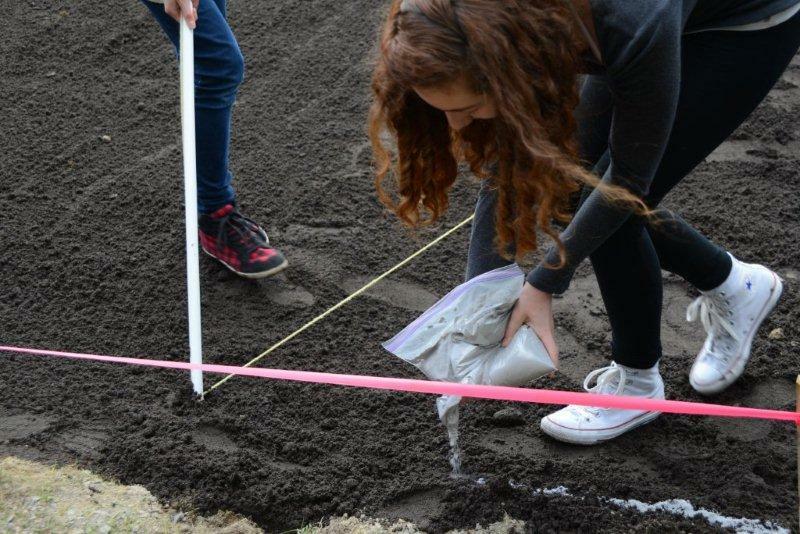 As soon as a group of students knew what to do, they were given the large scale compass to draw out the circuits in the soil. All the other students were simply gathered around to witness their actions. That was enough, I felt to be a part of the project. 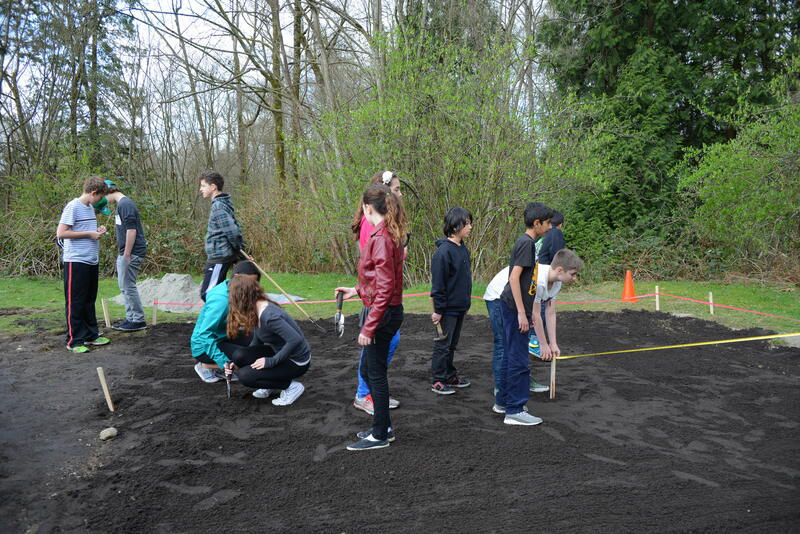 After the circuits were drawn out into the soil, another group laid the lime into the design to mark the circuits clearly so the next group could then dig out some of the soil and lay coarse sand into the area which would remain after the grass grew in for the pathways. 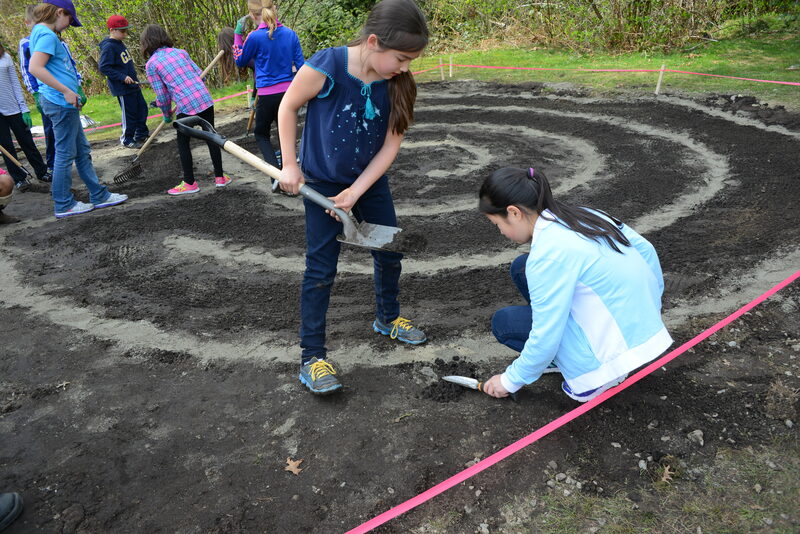 It took many hands and many explanations throughout the day of the actual creation and build of the labyrinth with groups of classes, helpers and various volunteers. What struck me the most was when we as adults stood with the students in silence before we started. 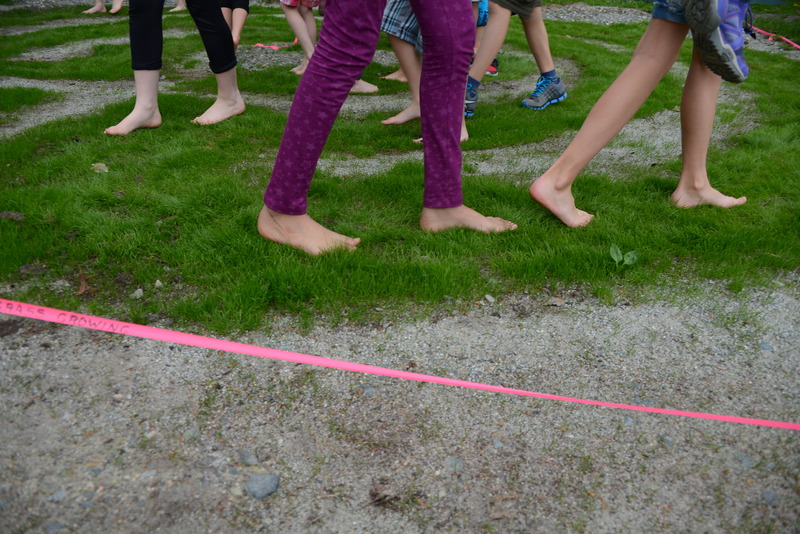 I found grounding us all as a large group was necessary as the whole process could have been chaotic and confusing otherwise. This was not a normal class project after all and the kids often came to us with too much energy. Circling them around me I asked them to close their eyes and feel their feet, taking in big deep breaths from the ground up. This brought them into a calm state but I also recognized there was a definite vulnerability here with many of the students. Asking a group “to close their eyes” can bring up a lot of issues…who else is closing their eyes? is this cool? is this funny? why are we doing this? All these questions and emotions could be seen from the centre of the circle where I was standing. It was clear who had done this sort of thing before, trusted in the process and got right into deep breathing and centering. Amazing. The others…well, maturity has its perks! No pictures of that moment. None needed really. Centering a group of kids will be chalked up to a moment to remember as one where I can remember a great power and responsibility too. When the kids set to task, when they understood what they were doing and more importantly, why they were doing what they were doing really became clear when a couple of the groups were able to walk the labyrinth paths as a group. After explaining about what it means to have an intention before they started, I lead them through with steps of purpose making it clear with the pace I set that this was not a race. No one was allowed to pass the person in front of them out of respect and as students left the circuits, the ones coming into the space, need to step aside to allow other students to pass with ease. Not every student completely engaged with this project as I mentioned before. The majority from what I could tell, understood what they were doing, watched or really took over a certain part of what needed to be done from shoveling sand, directing others what to do and where to go with said sand and making sure everyone was also doing what they needed to do. There were some that seemed distracted and disengaged. The teachers and I made small notes and one teacher was so concerned about a particular student, she made an effort to get this student to be a part of things by asking her to do a certain task. I noted this and as I am a sensitive person, also noted the discomfort this student had when she was approached. Later in the day, this same quiet girl came back to the labyrinth in between classes. Her class was brought out for a music class to play soccer. No idea why the music teacher brings them outside to play soccer but needless to say, this student who didn’t care to engage much with her fellow students was once again off to the side of things. She came to me and asked if it would be alright to walk the labyrinth as she hadn’t had the chance yet being in the first group who only leveled the soil. I of course said yes. Watching her was a gift. I had only explained to her via the whole school assembly how to walk the paths and she instinctively knew how to herself. She came to the centre, closed her eyes, turned her face up to the sky, with the palms of her hands facing upwards as if to ask for guidance. When she came out, she came to me and said “I went into the labyrinth missing my mom and brother (she is a foster child). When I came to the centre, two animals appeared to me; an eagle and a wolf. I don’t know what that means but I have a pain on my side now.” Not fully knowing what to say I suggested walking the paths again with the intention of releasing the pain on her side and asking for guidance as to what the animals represent. She promptly went back into the space and walked the paths two more times. Afterwards she told me that the eagle was her mother; ever present with her, giving her guidance and the wolf was her brother; sometimes good sometimes bad but also always with her too. To say that I was overwhelmed myself with this story she chose to share with me would be a massive understatement. I told her that I was so honored to have witnessed her walk and felt so grateful she chose to share her experience with me. Then off she went, to be with her 2 other friends to watch the rest of the class play soccer in the field as I almost fell over! Not every student is going to have this kind of experience. We know this. Having one student find peace out of 270 is enough for me. Not every parent is going to understand why we need this at all. One parent even questioned after months of explanation of what the labyrinth was meant for, what it was meant for. They even questioned if it was a religious tool as if they had not heard or read anything we had been sharing. But one parent hugged me in relief and gratitude for all I was doing and bringing this tool to the school at all. Many others really are beginning to understand it. It’s only been a month and there is no way to measure the impacts this project has had to the school community. We still have phase 2 to go which includes engraving some stones and inlaying them into the 4 corners of the labyrinth for reflection stations of Peace, Love, Gratitude and Forgiveness the 4 most important virtues I believe. We also would like to have the “Big Rock” engraved with the other virtues we have around the garden at the base of the rock. And we need a good plaque or sign that explains what the labyrinth is at all. Fundraising for this part of it will be a task but I have faith it will all come together exactly when it should. 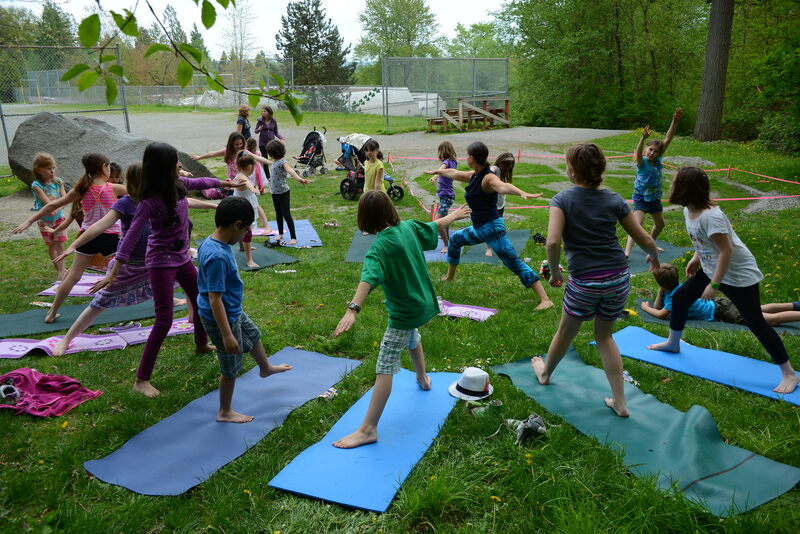 We have also had an amazing outdoor yoga session with Child’s Pose Yoga and the lovely Dana Mahon during a Garden Club on May 2nd; barefoot on colorful mats, complete with eye pillows and a marvelous pom pom wand. An official opening ceremony at the school is being planned for the Fall 2014. So as always, more to come! A couple of years ago at the start of the first Garden Club of the year, I asked the group what they wanted to do in the year ahead. I allowed them to choose a space in the school that could be something they transform by planting some seeds or making a bit more green. That was the first time I heard about the “Big Rock”. I never even really knew about this place until the group of 30 or so of the kids brought me to this space just beside the gravel field. Of course all the kids loved it! 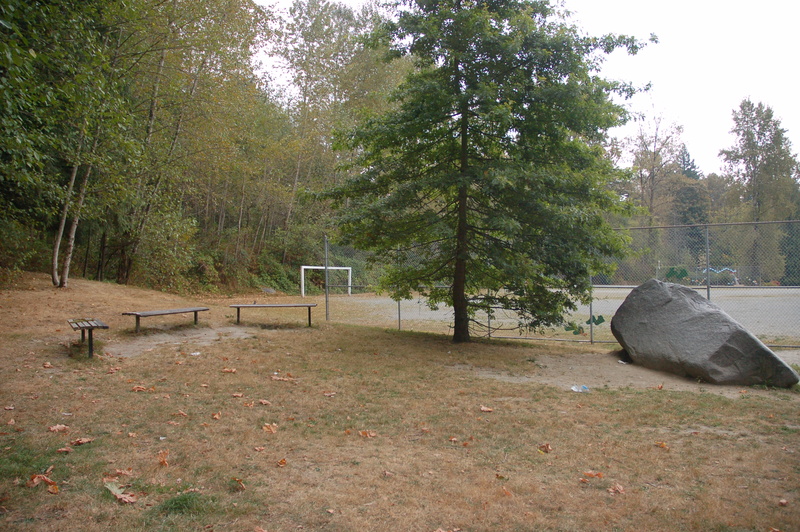 It had this massive boulder called the “Big Rock” that the kids immediately showed me how they all ran and clammered up to sit on, it has 3 benches, a wonderful oak tree and is surround by the forest. There is even a creek near by that you can hear after the rains. Most of the kids wanted flowers and maybe an arbor…a gate to welcome people I now remember was also part of the ideas…maybe a few more trees but mostly, lots of flowers. The plans and ideas sat in a folder for awhile and then while searching for garden ideas to create without much of a water source (no way our hose could get to that space and rain barrels are yet to be approved by the district) I came across the idea of building a labyrinth in this beloved space. A labyrinth is a path design that can be found in many forms: traced in the sand on a beach at low tide, painted on floors of cathedrals, lined with rocks in the dessert, rolled up in a canvass that can be spread out on a floor, or painted on concrete in all kinds of spaces. They are tools that people can use to find peace; a walking path of winding designs with one way in and one way out and a centre to stop and pause and reflect. 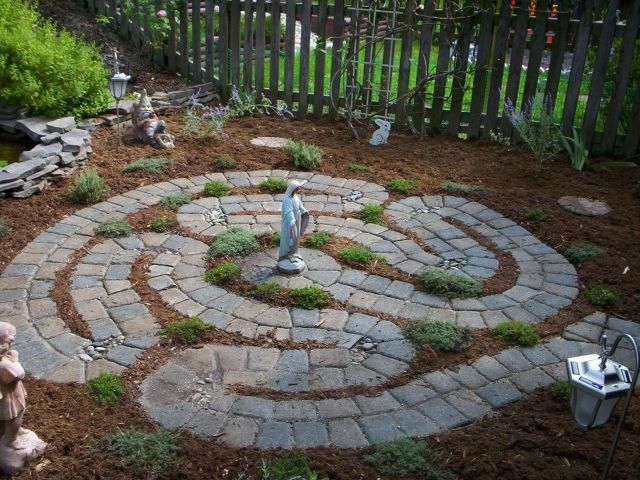 Ultimately, labyrinths are mindful tools that anyone can use when faced with an issue. The idea is that instead of looking outside for answers, the person walking the labyrinth finds the answer within themselves by the time they walk out of the labyrinth. We had no idea how to build or create a labyrinth. There are several sites on the net, a man who creates them at low tide at the beach at Spanish Banks (http://walkingalabyrinth.blogspot.ca/) sometimes and there is a labyrinth lady too. But when it came time to write a grant, ask for funds and design this thing, Merrill my side kick parent, Al our principal and I had never really experienced anything like this before. The key thing was though, we were all willing to figure it out. Everything is figure outable after all! 2 years pass by with many design ideas out the window. We looked at paving stones, adding a slab of concrete and painting the design on, in laid concrete or rocks. They all went out the window as the main concern was to be honest, what would the kids do with the rocks or paving stones? Would they could they pick them up and throw them at each other? How can we get this approved if there is any trace of threat of injury despite the intentions of what it is “supposed” to be used for? 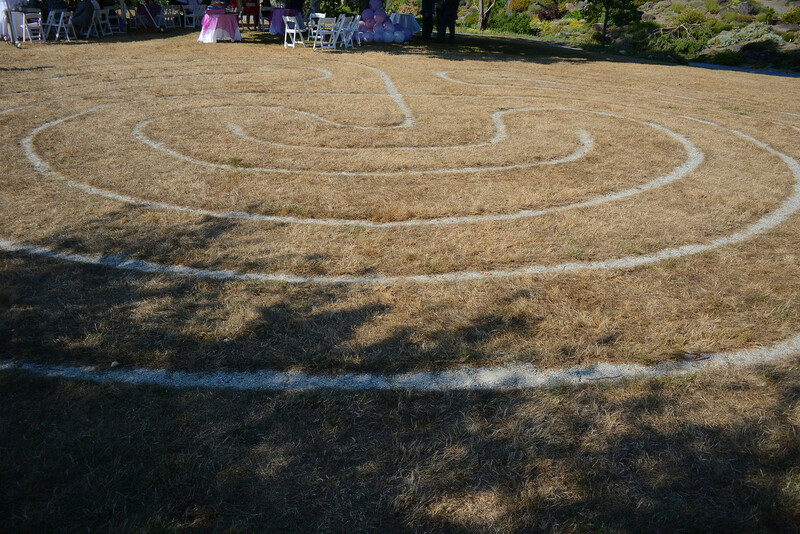 Finally, after attending a summer wedding at the UBC Botanical Gardens, I came across a labyrinth there…I almost actually didn’t even see it at first because the design was in laid right into the grass. Finally we had a design that would work. Mind you, we had submitted a proposal with the paving stones that was approved by the District so changing it to this we felt would be even better and easier to get done. Also, the costs of crushed gravel vs paving stones was a big difference. A grant submission went into the Evergreen Foundation which was a group I had long wanted to become more connected to anyway as Dolores Altin and I were connected from the first time we met several years ago now. A year after that, we finally had funding to start this project. 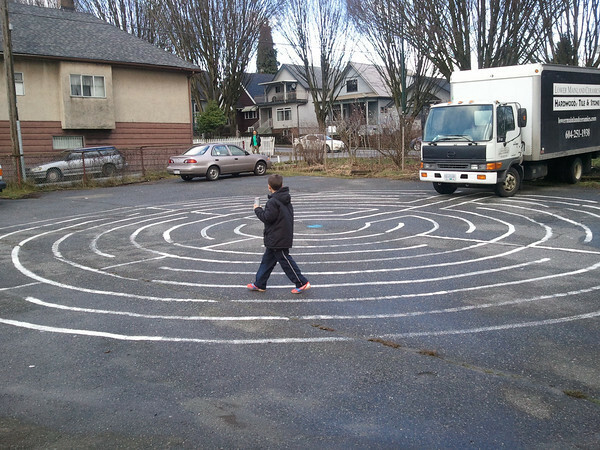 Most labyrinth projects at schools are created by teachers who are on board first. We worked a bit backwards, getting the staff on board after funding was secured. It wasn’t a hard sell though. Here we were offering a space to use for the classes outside of the classroom; a place for teachers to bring their kids when they were facing a conflict and needing resolutions. Comments from the teachers included: “I’ll be first to line up and use it on a Monday morning!” as yes, it does seem really easy for an adult to wrap their brains around. But what about the kids? 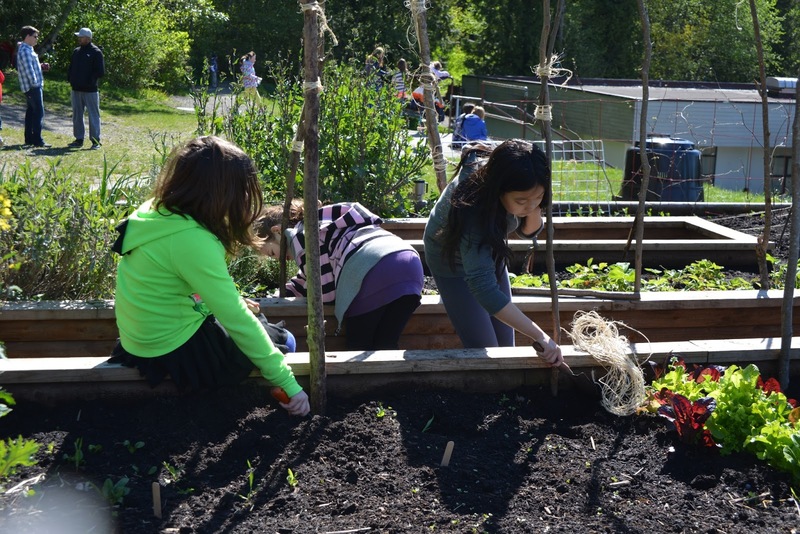 Getting kids engaged in planting of food seemed so much easier. Would they “get” what this labyrinth thing is even? All I could go with was what I knew of my Garden Club members and here was where a lesson in trust comes into play. You just never know what a kid already knows. When we talked about this idea to the group of kids who wanted to do something at the Big Rock, I wasn’t sure if they’d go for it. Some were definitely confused but one pair of siblings knew exactly what I was talking about. The two sisters went to a church that had a labyrinth and quickly, the older sister became my “go to” student for support. She always corrected anyone who thought a labyrinth was a maze for example: “no, a labyrinth has one way in and one way out” she would say. I also had the most memorable heart felt conversations with Anna when we talked about the idea of sand blasting our names on to the Big Rock itself. In a conversation up to the Big Rock one day during the planning phase,Anna thought about how great it would be to add all the names of the Garden Club members who came up with the idea for the Labyrinth. In reflection however, she said this: “The only thing with adding our names to the rock and not anyone else is that everyone else will feel left out and that’s not ok.” Instead of squashing her whole idea, I suggested we echo what we have around the garden and engrave the words of Virtues instead, those words will never change as being a part of who we are after all: Peace, Love, Compassion, Trust, Forgiveness, Service, Responsibility, Confidence, Respect, and Patience. I checked with Anna and she liked this idea. See, this is what I love about these projects; when else would I or anyone have the chance to have this kind of conversation with a student? When else can we allow their light to shine this way? That is the intention with this space and the garden space, platforms for greater heart felt conversations. I just feel blessed to be a witness to these thoughts and so many others these kids can have. And here we are, on Pi Day March 14, 2014, having just finished presenting the whole idea to the entire school. Standing before the large crowd of 270 (minus one class on a field trip) I found myself wanting to be a channel to my higher self and just allowed the words to flow. I wanted to explain the best way I could what the labyrinth will be, how it can help them, how it is everyone’s and that we need to respect it, how it will be a legacy piece for the Grade 7 students (let alone a math lesson!) and then how to use it when it has been built. All eyes were on me with focus and interest and even the little K’s were for the most part, quietly listening. I included my story with Anna and watched her face light up with recognition. The virtues were mentioned and even though Olivia helped us 3 years ago, her hand still shot up with a memory of the day she painted the word “Confidence”. We hope to have inlaid slabs of stone engraved with words like Peace, Forgiveness, Love and Gratitude that will be stations for the students to stop and reflect upon in the future as well. Al our principal, ended the assembly the best way ever, with a slide show compilation of photos of the kids from the past year to the songs “Brave”, “Roar” and “Happy”. Of all the things we can teach our kids and this is where I resonate most with our principal, it is to be happy. 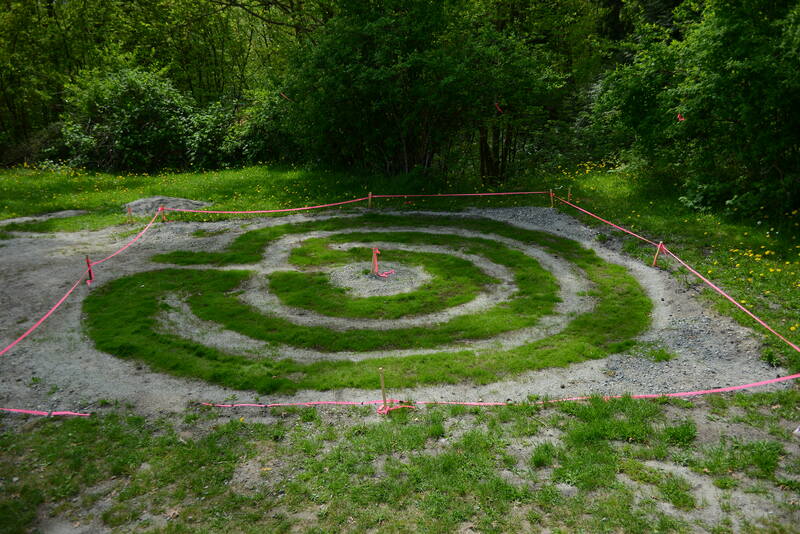 I hope this labyrinth as tool for mindfulness will be used for the kids to find their own happiness within themselves. What we are hoping to achieve by the end of the year is a design similar to this one at our beloved Big Rock. 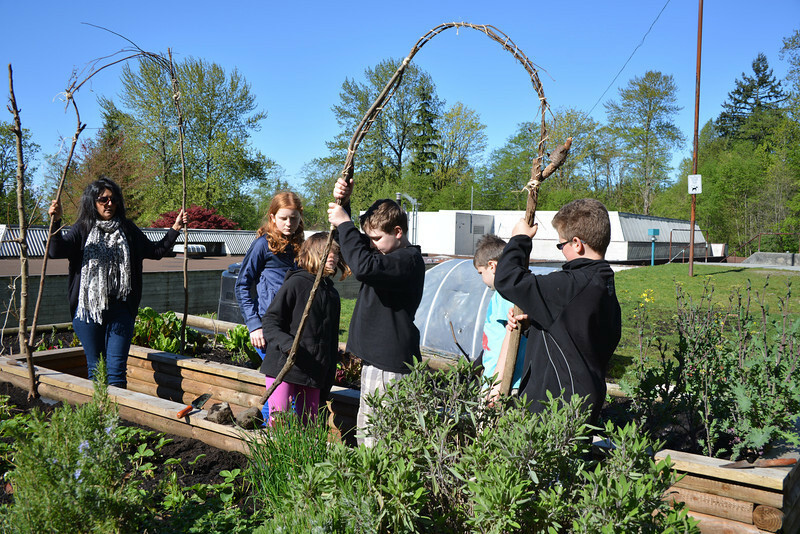 Of all the key ingredients to creating a successful and sustainable school garden projects, in my journey, I say I could not have done nearly as much without the unwavering support of who I call my “Wonder Twin” Parent/Partner in change, Merrill. After an extensive search through all my photos, and I have at least a 1000 by now, I can barely find any of Merrill. She is a very private person; no social media connection at all and only appears in the background of the many events we’ve had at the garden. Despite that, she is a huge part of this project and I’ve been called to publicly thank her. You see, when you embark on a project that involves many barriers and obstacles, there comes a time when your voice gets hoarse after repeating yourself so many times in so many ways; from grant applications to committee reports to any kind of reports. In the late hours of one particular evening writing an extensive grant, explaining for the umpteenth time how important our project and program is, I lost my voice. I literally tired of saying the same thing over and over again in different ways. 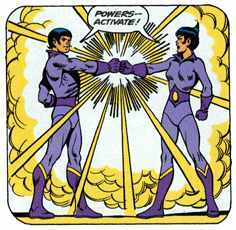 That’s when my Wonder Twin stepped in with her unwavering energy. In saying “I’m done.”, she was able to step in and continue. I hung up the phone and she continued to type out the grant application till God knows when. The wave of gratitude that washed over me when I went to bed that night was immense. Everyone needs a “Merrill” a “Wonder Twin”; to voice what you already know but may have forgotten, to keep going for you when you are tired and to remind you of what is truly possible and when you join forces, you truly feel you can do anything! The phrase “Surround yourself with like minded individuals” resonates deeply when I get asked how I did this. It’s an understatement. 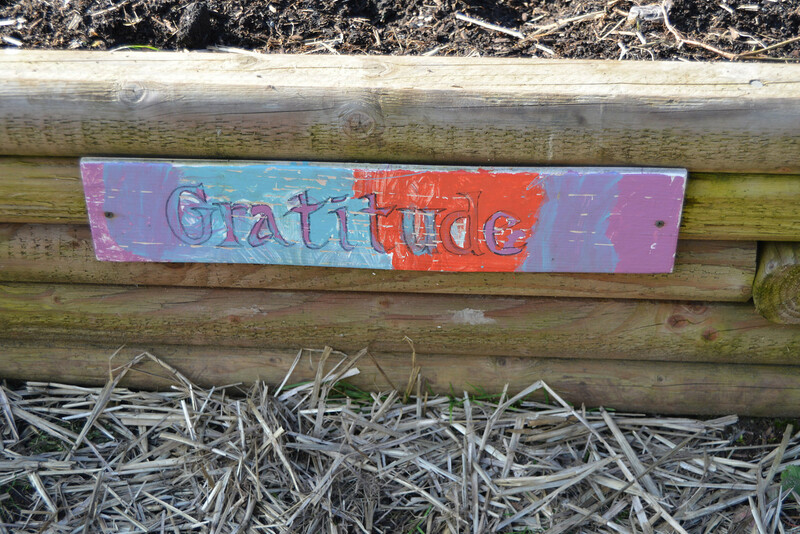 You need people who believe in a school garden project as much or more than you do. You need people to have a similar vision or greater with ideas you wouldn’t think about because you can only be focused on so many things at once. You need that group of folks that will show up in the rain, blaring sun with toddlers in tow because they believe in the project that darn much. And if you are one of those volunteers who believes you don’t have that much to offer, I suggest you re think that one because if all you have is the faith and belief in the project, that is really all that is needed sometimes. If you can show up to shovel some soil, nail a few pieces of lumber together, sow some seeds or hold a hose, you are a help. If all you have is the time to put a few ideas in an email, send them along and say, I believe in this and these are my thoughts, that is also enough and in fact, all that is needed too. Again, to my Wonder Twin Merrill, who will read this at some point one day, on behalf of all the seeds we’ve planted together, times we’ve watered those seeds in the moonlight and fruits of our labour we’ve harvested,I truly love, honour and am so grateful for you! At first glance, this post could very well be about Swiss Chard, a gorgeous edible that grows in so many wonderful colours that it is actually referred to as Rainbow Swiss Chard. In fact, these plants featured in this picture are Rainbow Swiss Chard but why I took a picture of these poor plants is actually what this post is about. Upon arrival at the garden Sunday evening to water after yet another sunny summer weekend, I found these sorry plants laying outside the garden, roots exposed, and a bit of soil around them but very weak and wilted…I’d dare say almost dead. I was about to capture the sun setting on the sunflowers and post about the glories of the garden but had to deal with these plants in need of extreme help right away. It was amazing how fast my emotions shifted from gratitude for the sight of the sunflowers to horror with the sight of these extracted plants. Why would anyone do this? When could this have happened? Who did this? Of course these were questions running through my head on top of, I’ve got to get these into the garden and soak them with as much water as possible as soon as possible. Instead of dwelling on the why, who or when, I focused on how I could help. Isn’t that the message most of us should focus on when encountering a problem? Focusing on the solution instead of what and why? I dug them in as quickly as I could and really soaked them well with the thought it really would be a miracle if I could save them. Then I remembered our signs of virtue and what has already been taught to the kids in the Garden Club. 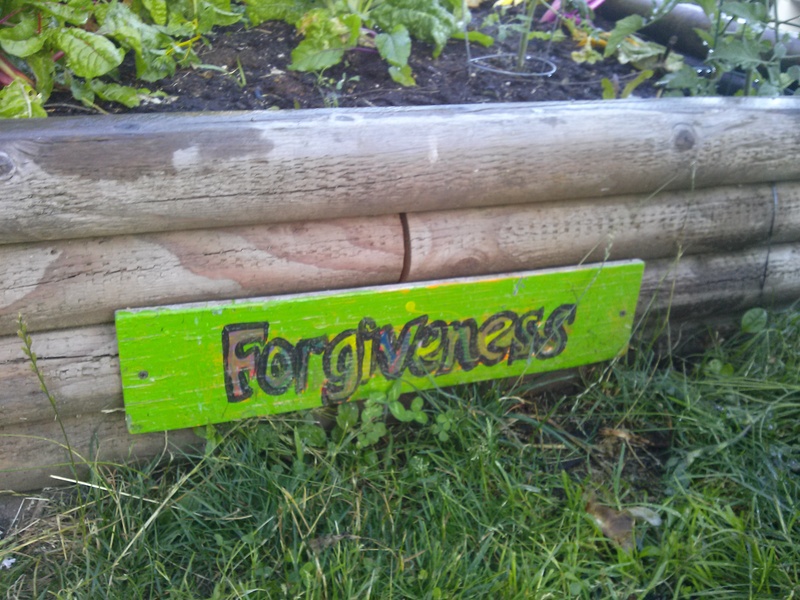 One of the signs, actually right near where these plants were pulled is Forgiveness. 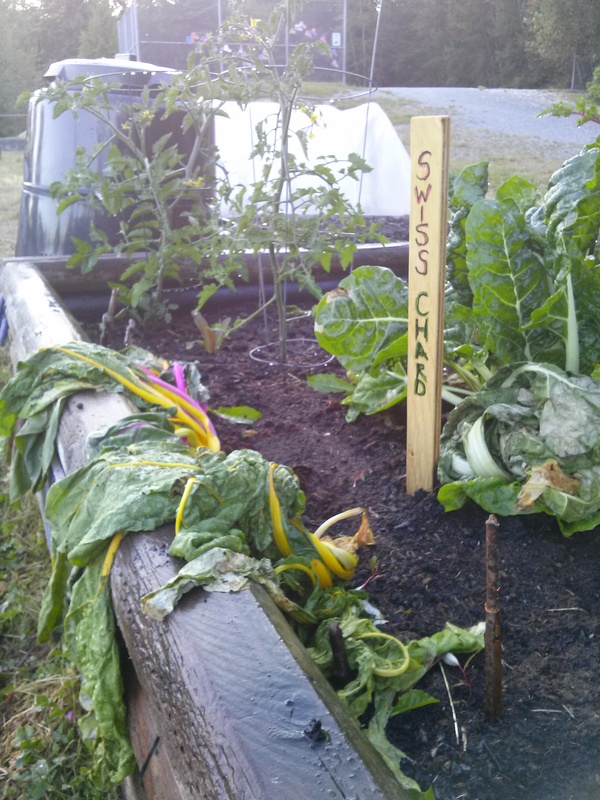 When I speak to the children about vandalism and this is exactly what the “Swiss Chard incident” can be referred to, I also include a chat about forgiveness. In the simplest of terms, forgiveness means “giving up that the past could be any different.” Admittedly, this quote comes from Oprah Winfrey but it is so simple and so easy to translate back to children that I thought it works best. It worked so well for me to give up that the plants were not pulled out and the past could be different. It happened and now it was time to move on. In saying that it happened however, also meant that this incident happened for the second time. Last year, when the same coloured bright fushia pink and evervesent (sp?!) yellow plants were growing in the garden, they too were yanked out. So questions do naturally come up about the fact that maybe someone out there believes they are actually weeds or harmful to the garden. Needless to say, if it is the same person, they actually deserve even more compassion, another sign by the plants and a heaping cup of forgiveness. Perhaps even some education around the plants would be helpful if we could ever figure out who did this. 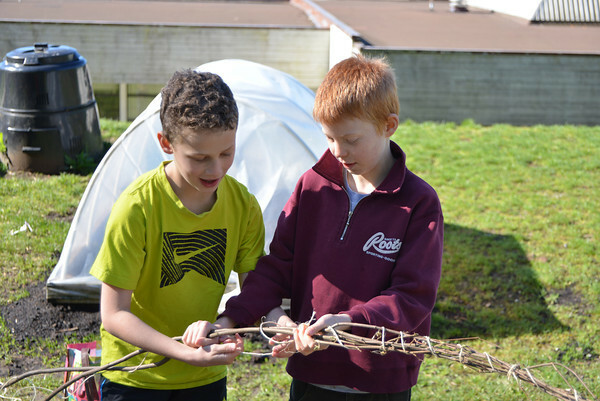 The idea of building a solar oven to cook something from the garden was inspired by one of the first parents who helped us build the garden in the summer of 2011. Neil and I were sitting at the garden one day in the extreme heat when he told me that you could easily build a solar oven with the kids and do a slow cooked recipe. At the time, we had little growing and less opportunities to create the solar oven so the idea sat shelved until this summer. Eddie, a leader from The Grove Childcare Society and volunteer teacher in the school who’s been integrating curriculum all year with the various classes took this task on with great enthusiasm. Although he wasn’t able to attend the cooking class at the Grove during the week I was there to cook with the kids, he did manage to build the oven before he went on vacation. We didn’t know for sure if the solar oven would work. We didn’t know it would cook anything let alone keep it warm. The weather had been really amazing with lots of sun in the past but there was no way to predict the future. All these factors were translated back to the kids. Despite the “unknowing”, we tried anyway because as Master Yoda says: “Do or do not. There is no try.”. So we did. We threw some sliced onions wrapped in foil, split up cloves of garlic, a head of garlic sliced open all drizzled with some olive oil, salt and pepper and a pot of pre cooked veggie soup to simmer. All the kids were fascinated by the oven; each taking a turn to go outside and check on it. We even had the young 3 to 5 year old group come out and look. They asked questions like: “How does it work?” “What’s making the food cook?” These were just the questions needing to be asked. There was even a brief conversation about renewable and sustainable energy with a very bright 9 yr old. The day started a bit cloudy but by 10 am, the sun was out full blast. The oven had to be moved with the sun a few times and it blinded you to look into it as it was just like staring into the sun. By 2 pm, the foils were warm and the onions and garlic were slightly translucent, yet not quite roasted. Anyone who has tried roasting garlic knows that this process takes time anyway and at the very least, an oven at about 300 degrees. We used the garlic and onions in our spanakopita during the afternoon cooking session. So were we successful? Was the solar oven worth the try? It was a free left over box and a few sheets of aluminum foil. The result wasn’t a meal to serve to the whole group and there certainly isn’t a need to patent the invention. But the oven did, ahem, spark curiosity and a few healthy conversations. Most of all, I’m hoping it encouraged the group to try, experiment and see what happens. Sound and even look a bit weird at first but the idea comes from the fact we try to use as many things we grow in the garden in recipes we cook with the kids. 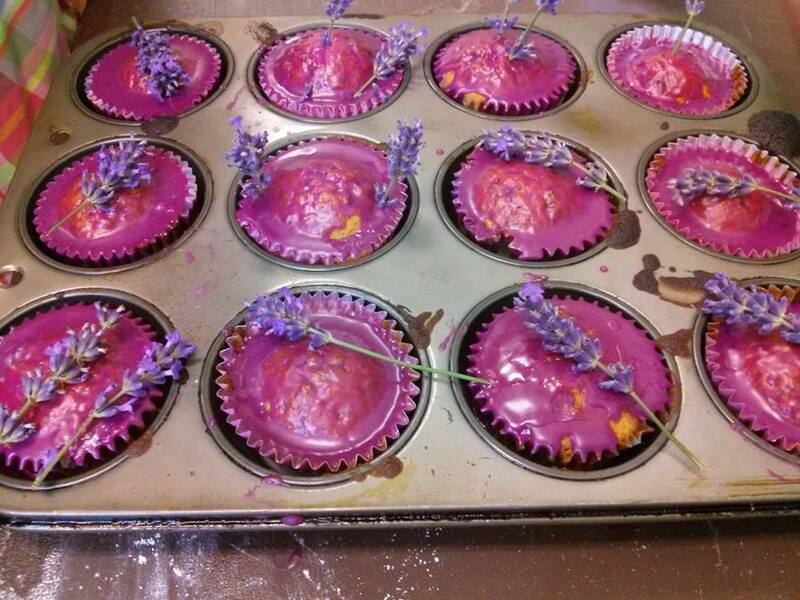 Lavender isn’t exactly edible but I was able to find a few sources of inspiration. I first saw this recipe in Forever Summer, a cookbook by my personal domestic goddess idol, Nigella Lawson. As you can see from the link photo, the cupcakes looked whimsical yet delicate and fun. The recipe called for just a few drops if not just one drop of violet food coloring and a small sprig of lavender on top. Interestingly enough, I actually couldn’t find the original Nigella Lawson recipe online but it is in her original Forever Summer cookbook. If you do want to look into Nigella and what makes her so fabulous, I actually encourage you to You Tube her and watch a couple of her episodes. Her food writing and recipes are so inspirational. Plus she keeps her nail polish in the fridge and munches on her leftovers in her pj’s! Harvesting the lavender on the Saturday Work Bee, the lavender was at it’s peak and just finishing it’s blooms. Some buds were not yet open and this didn’t seem to matter. After drying for just 2 days, the cooking class was the following Wednesday, I removed the buds from the stems and layered a tsp or two in between layers of about 1 cup of white sugar. Yes, I used white sugar…only this once though I promise! In the middle layer, I broke up an old vanilla pod and the result was truly heavenly smelling. The volunteer I had helping me the day of the cooking class wasn’t told to process or grind up the sugar mixture and simply added the whole lot to the cupcake batter. Wow, the result was really an experience. I can only relate it to “having a bath in your mouth” To some this might sound quite distasteful but really, it is worth a try. And all the kids did without much hesitation at all. None were left and little complaints were heard either. Summer can provide the most amazing opportunities to spark creativity, inspiration and love of food. 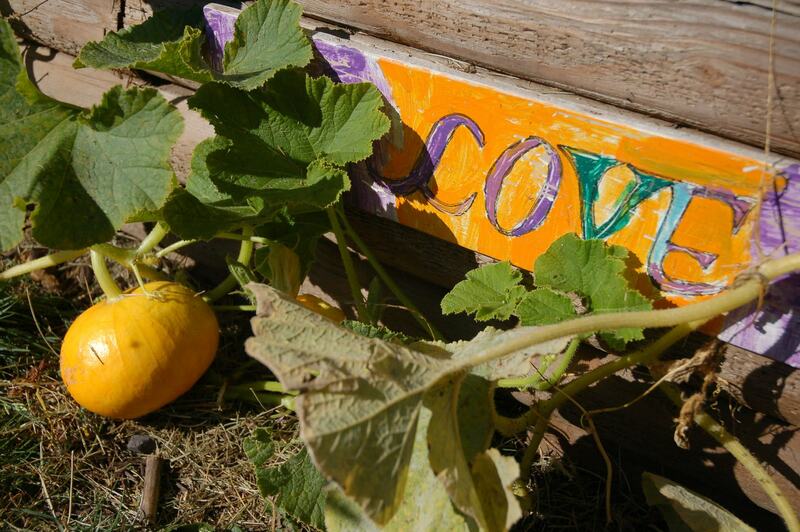 Gardens are at their peak afterall and if all you do is try a few recipes inspired by summer, you are at least sparking the imagination of your kids to plant seeds of fun, growing and cooking with food of all shapes, colors and sizes. Full of Beans! The beloved, Bean Archway was created for the second time this year. This is a great way to provide both support for growing pole beans as well as shade for the garden and a cool hang out place for the kids. Last year was the first year we built the archway and by the time fall arrived with all the kids back to school, it was full of beans! It was an instant hit with the kids looking for a place to hide, chat or find a quiet place to sit. Instead of purchasing poles or structures, we went out into the surrounding forest to forage sticks and branches we needed. Two groups of classes worked together in smaller groups to create these structures. Disclaimer here…lesson learned about having 2 class groups work on this structure. In the 2 classes, there was about 50 kids total. That was 30 kids too many. Most were playing on the playground or soccer instead of actually helping. It was difficult to engage the whole group. I focused instead on the kids who actually wanted to help. 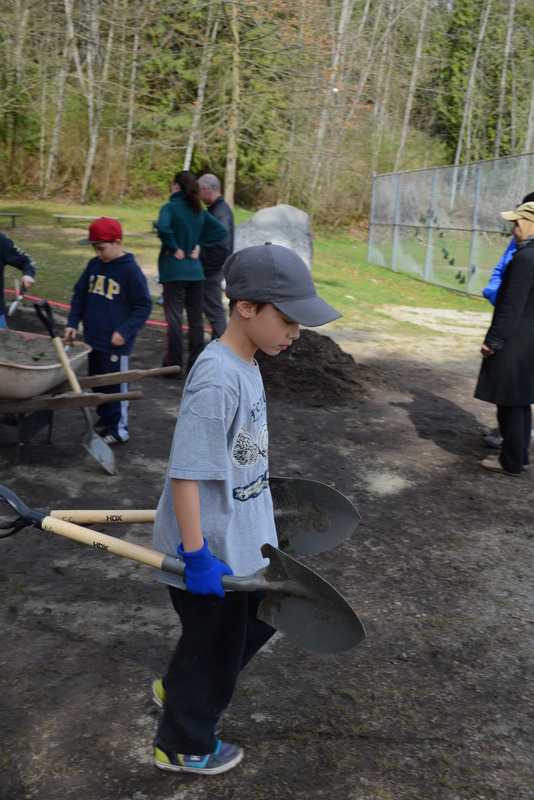 There were groups who went out with an older volunteer to saw down sapling branches and collect sticks, a group who cut up twine, a group who dug holes in the garden for the initial support poles, and a few who helped drill in the poles. 3. Determine how many archways that would work best for your garden. This year, we went with 4 archways with 3 poles in the front part to create less of a tunnel effect and more space for the beans. 4. Forage for enough poles for both sides. In our case, we needed 8 long poles, one for each side about 5 ft. We also decided as the group created the archways in different lengths that it would be cool to have a shorter entrance way with bush beans in the front and gradually have the archways get bigger. 5. Once poles have been collected, collect lots of sapling branches to create the arches at the top. 6. On the ground in a separate space, measure out the approximate space between the poles according to how wide your two beds are. In our case, that was about 2 ft.
7. Put the two poles on the ground 2 ft apart and then start binding the sapling branches on one side curving them over to the other side. 8. Once each archway has been created, bring them over to the garden space and position the bottom poles into the garden. 9. Secure each pole with 2 deck screws by drilling them into the sides of the garden. We used large rocks the year before and the result was that some of our beans didn’t grow that well and the archways were not that secure. Remember, beans have quite the root structure and need lots of space. With high winds and rains, the deck screws gave me much more security. 10. Once the archways are secure, plant about 3 to 4 beans around each pole. We used saved harvested beans from the previous year hence my suggestion of more seeds than normal to ensure most grow. 11. 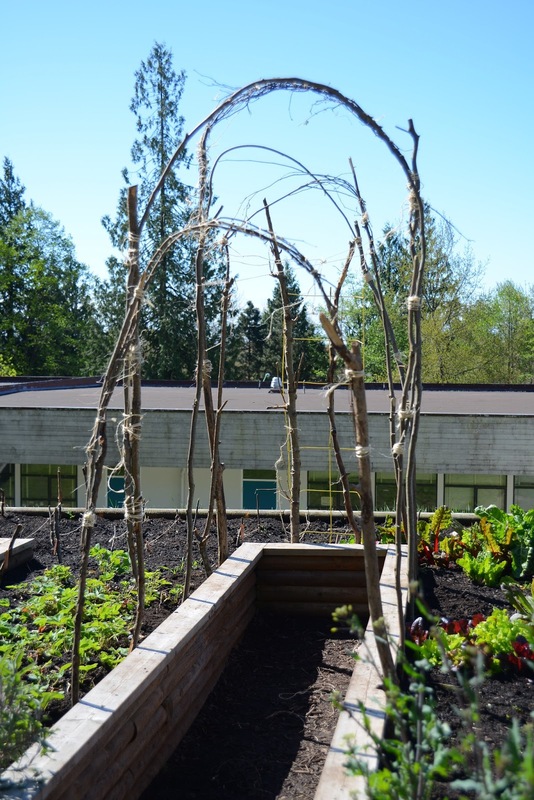 As the bean plants start to grow, and you have to be uber patient for this because they take a while, start adding smaller poles/sticks in between the archways. Anyone who’s grown beans in a clear cup in the classroom (in the fall I might add…le sigh!) will notice, the roots grow first, then the sprouts and then the leaves. 12. By early July, with a warm spring I’d add, we have beans spiraling up and along the poles! 13. Flowers appear first and then soon, you’ll start to have beans!